I’ve been working on this website pretty much non-stop for the past 18 months in whatever free time I can find. I love working on this site – I now spend more time working on it than I do actually playing the ukulele (which is ironic as I only ever set it up to help me learn), but that’s ok with me as I enjoy both. 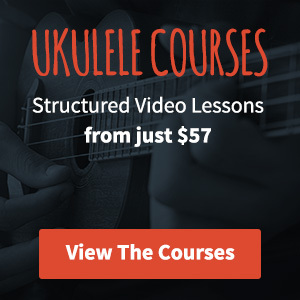 As a website, Ukulele Go makes almost no money. I do get the odd affiliate payment from a products that I recommend (probably enough to buy me a beer once a month) and I have a couple of advertisers. Beyond that there’s no source of income. I have no books or products to sell – I never went into this with that intention. It was always just intended as a bit of a learning log for myself that might also help a few other people out there. Currently my monthly newsletter (which I love sending) is on the brink of costing me hundreds of dollars a year just to send it out. Right now I’m trying something new. I’ve signed up with a service called Patreon. If you’re a fan of Ukulele Go and want to help support me (and the website) you can pledge a very small amount of money ($1 a month for as long or a little as you feel like) as a thank you. If I were you right now, I’d be asking what’s in it for me? Well firstly you’ll get a warm fuzzy feeling inside knowing that you’re supporting an independent creator. For some of you, that might be enough – but there’s more. Patreon allows me to publish exclusive content that is only accessible to those that are helping to support the website through Patreon. I’ll be posting exclusive tab, lessons, videos, guides and more. The reason that I’m doing this is so that I can commit to spending more time making better content. Ukulele Go will continue to have new content posted regardless. If you can’t support me right now or just don’t want to, no problem. Ukulele Go is still here to help you learn. Support Ukulele Go at Patreon! I joined Patreon as a fan of Amanda Palmer, to get her content directly. And I had considered it for my own writing/blog/books. I spent some time working on the plan, levels of support, and such, but didn’t have enough to offer more than a level or two. Hey Adam, Patreon is definitely an interesting platform. I spotted that Amanda Palmer is also using it. Part of the reason I’m doing this is that the newsletter is about to start costing me hundreds of dollars a year to keep sending and I’m really not sure how I’ll be able to continue to send it. I/d be happier giving you a one off donation so would the just giving or paypal donation be possible for you to set-up?